FitnessRX for Women > Nutrition > Supplements > How Much Protein? I’m writing about protein because I receive many e-mails asking about my diet; people wonder if I only eat protein, if I eat just fish, how much protein to include in the daily diet, etc. First I want to be very clear about the quantity of protein, because over-eating protein or other macronutrients will result in fat and weight gain. It’s also important to know that the calories are very important when you design a diet. To know the exact grams that a person has to eat is impossible, but some research can help to find a good formula for a balanced diet. So how do you calculate your protein needs? It depends on multiple factors, including height, weight, activity (sedentary, active, elite athlete). You’ll also find this proportion in some bodybuilding and fitness articles: 0.8-1.5 grams of protein per pound of bodyweight. Another way to calculate how much protein you need is by using daily calorie intake and the percentage of calories that will come from protein. To do this, you’ll need to know how many calories your body needs each day. To factor protein into your total daily calorie intake, you just need to know that 1 gram of protein contains 4 calories. Multiply the grams of protein you’re going to eat each day by 4 to figure out exactly how many calories your protein intake will account for. For example, my weight is 130 pounds. I eat 130 grams of protein per day, and 130X4= 520 calories from protein per day. • The American Heart Association recommends that 10 to 15 percent of your daily calorie intake come from a source of protein. • Protein is a vital part of every tissue, cell and organ in your body. Protein is in a constant process of being broken down and replaced by the essential amino acids in your diet. Proteins are composed of chains of 20 different kinds of amino acids. • Your body uses protein to make enzymes, antibodies, hormones and other body chemicals. 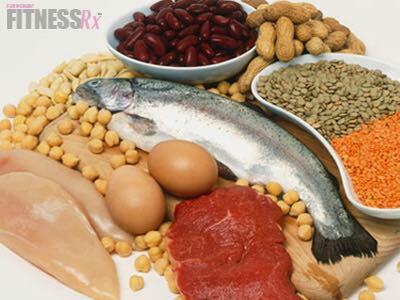 Protein is an important building block of bones, muscles, cartilage, skin, teeth and blood. • Non-essential amino acids: alanine, cysteine, glycine, serine, histidine, tyrosine, cystine, proline, arginine, aspartic acid, glutamic acid and glutamine. • Essential amino acids: Valine, threonine, leucine, lysine, isoleucine, methionine, phenylalanine and tryptophan. I hope this article helps you to understand that the quality, calories and quantity are important for achieving a balanced diet. If you eat more than your body needs, you will gain fat. Balance is the key! Position of the American Dietetic Association, Dietitians of Canada, and the American College of Sports Medicine: Nutrition and athletic performance. J Am Diet Assoc. 2009 Mar;109(3):509-27. DietaryFiberFood.com. RDA: Protein Requirement for Humans. Accessed: Sept 22, 2009 http://www.dietaryfiberfood.com/protein-requirement.php.